It seems like each week, the news reports all the clever new ways that criminals are trying to scam innocent victims out of their hard-earned money. Before the big rush of tax season, we talked a little bit about some of the popular scams that thieves were employing to get the personal information of their victims. First, a little recap. Keep in mind that the IRS will NEVER send you text messages or emails to request personal information! If you’re looking at a text that is “from” the IRS, it’s safe to say that someone is trying to scam you. DO NOT reply! Report the incident by forwarding the message to the IRS. The same goes for emails. If you’ve received an email from someone claiming to be with the IRS, do NOT open any attachments included in the email! Forward the email and its contents directly to the IRS so that they can handle the matter. If you’ve been the victim of a scam or identity theft, first of all report it! So many people fail to take this critical step. I’m sure you’re a little embarrassed you fell prey to such a scam, but, by reporting it, you’re stopping other would-be victims from dealing with the same situation. Make sure to report to both local and federal (if applicable) authorities. Next, make sure to take appropriate follow-up steps. For example, if you’ve been the victim of a tax scheme in which someone stole your identity and filed a fraudulent tax return, make sure to fill out the appropriate paperwork (Form 14039) and report the potential for fraud to one of the major credit bureaus (Experian, TransUnion, and Equifax) so that your accounts can be flagged. Also make sure to follow up with your local bank and other credit card companies to ensure that no fraudulent transactions have taken place. By taking all of the appropriate actions, the ramifications from the incident can hopefully be mitigated. If you have additional questions about popular scams and how to appropriately deal with fraud schemes, make sure to check out the IRS website. It’s updated regularly to reflect any new schemes that are taking place and what actions should be taken by victims. If you have tax questions (personal or business), contact our office today! One of our friendly staff members would be happy to help you to customize a solution to your tax question. Best of all? The consultation is completely free! Give our office a call today to schedule yours! “Taxpayer Guide to Identity Theft.” Internal Revenue Service, www.irs.gov/newsroom/taxpayer-guide-to-identity-theft. 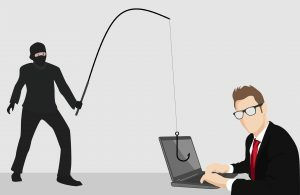 “If / Then Scenarios for Taxpayers Who Get Phished.” Internal Revenue Service, www.irs.gov/newsroom/if-then-scenarios-for-taxpayers-who-get-phished.